CRP is a city role playing mod created with better quality and performance than Iban's. It's an entire mod on it's own and has many of the things that Iban's has but greatly improved. This is not an edit of Iban's. I created CRP as a new mod in mid 2011 because me, and everybody else, was getting tired of Iban's piece of stuff. It was slow, poorly written, and lacked features that added to the gameplay. Below is a list of the key features CRP has. • Self Defense - Instead of waiting for a person to become wanted for you to kill them in self defense, you can kill them right away with the hammer. Not only is self defense incorporated into the damage system, it's also incorporated into bounties, pickpocketing, and breaking and entering. • Clock and Tick System - Apart from having ticks, the ticks are in line with the in-game clock. As well as that, the day cycle is synced to the in-game clock. If you buy a cellphone with /buy you can see when your next paycheck comes. • Dynamic Paychecks - Your paycheck will decrease by $1 after every paycheck you get. Your paycheck increases back to its original value after you do your job. • Laboring System - If sitting around waiting for a paycheck isn't your thing, you can chop trees and mine ore instead, sell them for money, or build with them. • Residential, Commercial, Industrial, and Admin Lots - Different lot types help determine what your build is. Just building a house? Use a residential lot for the least amount of taxes. Building a shop? Use a commercial lot so you can use transaction events. Want to decrease your taxes? Place an industrial lot in the industrial part of town and build a factory. • Custom Terminal Models - Tell the difference between a bank, an ATM, and a police brick easily. Also including a custom safe and rock model. • Witness System - To benefit the criminals you won't get demerits for crimes nobody sees. Take people into secluded places to get away with murder. Break into houses when nobody is looking. Be a better criminal by using this to your advantage. • Click to View - As a policeman you can view a player's wanted level by clicking on them. Bounty hunters can also view player's bounties, shop workers can view people's money, laborers can click resources to see how full they are, and lawyers can view player's demerits. • ATM's - Don't want your costumers to run to the bank to make a sale? Place one in your shop to increase efficiency. 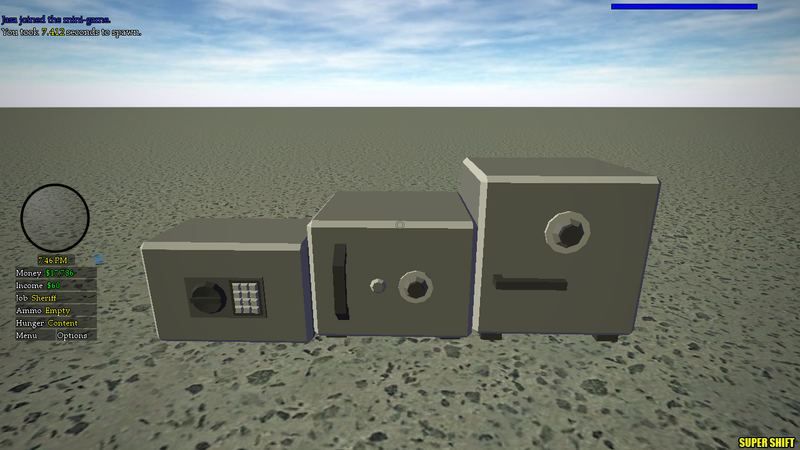 • Safes - Store your lumber, ore, and an item to stop from loosing it when you die. If you don't want to go to the bank to make a deposit, just put it in your safe as well. • Experience System - Instead if buying education and sitting around, you can move up in your career by doing your job. Every job has a way to get experience, so get to work! • Drugs - Buy drugs, use drugs, get wasted. • Drop Stuff - Drop your current item, lumber, ore and money when you die. Or use /drop to drop money, lumber, or ore on the ground for people to pick up. • Custom Client - View a list of jobs, commands, vehicles, items, and stats all from one place. View your money and quick-stats from a toggle-able HUD. View real estate lots as well as your own lots from a custom GUI. • Custom Events - onDay and onNight events triggered randomly between 7 and 8 AM and 7 and 8 PM. requestFunds event for shops and busineses and giveFunds event for casinos and factories. • Healing - Doctor jobs that can heal by clicking players as well as events. • High Performance - CRP uses about 5* less CPU than Iban's. It has also been tested with over 50 players and proven lag free. Q: Why can't I kill somebody that took $5 from me? A: $5 isn't worth killing over. Q: Does this have hunger? A: Yes, but it decreases really slowly. It takes around 2 hours to starve to death. Yes, but it decreases really slowly. It takes around 2 hours to starve to death. I hate forced roleplay like hunger but ok.
Good, self defense. I like that. just when Furdle registered an account! that apply for job button is loving ugly. Jobs should be sorted by path, aka at first you see all the paths you click on it it clears then at the top it says ^ go up and then all the jobs in that path. ^go up brings you to the path list. this is simple but it makes so much sense. The mod needs some delivery functions, so you can have jobs like a pizza delivery guy. If you get a proper economy system running I'm in on this. There should be manufacturing and packaging, shouldn't be simple to create food and items- only the big boys can make them. What about a farming system and a farmer's market?